Teaching Blog Round Up: Encouraging Student Self-Reflection... With a Freebie! Encouraging Student Self-Reflection... With a Freebie! Hey everyone! It's Angie here from The First Grade Scoop. We have FINALLY started our spring break... I am so excited! This week, we had conferences, and I wanted a tool for my first graders to use to reflect upon their learning thus far. We've been doing lots of self-reflection in writing (spurred by an action research project I'm working on), and I wanted to apply it across the subject areas. I think that, with coaching and practice, even our youngest students can think about what they do well and celebrate those things, while also considering things they can do better to improve their learning. So... I created this little printable to use with my students. While we went over how to complete it on the Elmo, my students considered things they did well in reading, writing, and math. Some of my students were very insightful, noting things like, "I'm getting better at including details in my writing" and "I need to work on checking my answers in math." Yay, right?! 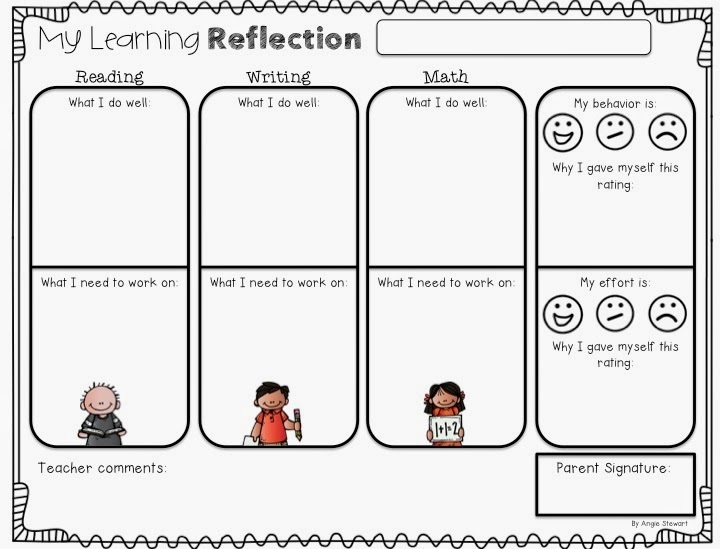 I also wanted a student-friendly way to self-evaluate their behavior and effort, so those boxes were added as well. Finally, I had a section for teacher comments, and a signature line. Since I saw each parent personally, I didn't have them sign it, but I might for future quarters when parents don't come to meet with me. If you're interested in downloading, just click the picture below to grab your free file! Off to enjoy a little well-deserved R&R! See you next month! WOW! My First grade team has been brainstorming for a great Self Assessment form. Thank you very much!